Imaging findings are more reliable than laboratory investigations in establishing a diagnosis. B-scan ocular ultrasonography reveals a well-defined cystic lesion with clear contents and a hyperechoic area suggestive of a scolex. This may be observed intraocularly or within the extraocular muscles. Associated retinal degeneration, if present, may also be observed. Ultrasonography is an effective and economic alternative to MRI and CT scanning to detect cysticerci in the orbit and in eyes with hazy media. [30, 31] See the image below. B-scan ocular ultrasonography demonstrating cysticercus within an extraocular muscle observed as a well-defined cystic mass with a central hyperechoic area. 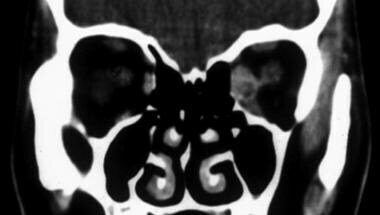 CT scanning of the orbits is a reliable technique to help establish a diagnosis of ocular cysticercosis. Compared with MRI, CT scanning is less expensive and less time-consuming. The characteristic feature is a hypodense mass with a central hyperdensity suggestive of the scolex. Usually, a solitary cyst with wall enhancement is observed. Adjacent soft-tissue inflammation may be present. The scolex may not be visible if the cyst is dead or ruptured and has surrounding inflammation. Concurrent neurocysticercosis may be present and should be excluded. See the image below. 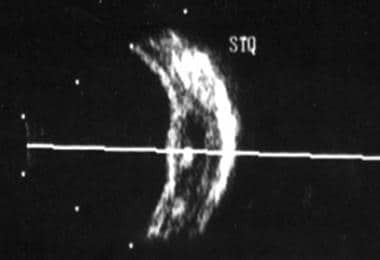 CT scanning of the orbit demonstrating cysticercus within the medial rectus muscle observed as a hypodense area with a central hyperdensity suggestive of the scolex. MRI reveals a hypointense cystic lesion and hyperintense scolex within the extraocular muscle. See the image below. 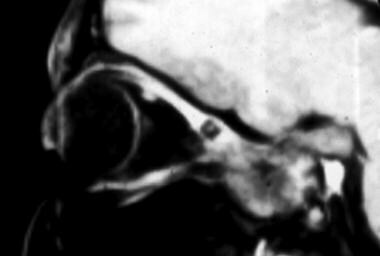 MRI of the orbit demonstrating deep orbital cysticercus within superior muscle complex observed as a hypointense area with central hyperintensity compressing the optic nerve posteriorly. Fine-needle aspiration of the cyst may be obtained to confirm the diagnosis. Tissue reaction is less or minimal when the cyst is alive. Scolex with hooklets may be identified within the cyst. Gradual absorption of the dead parasite results in a violent tissue reaction. The fibrous cyst wall may be surrounded by a florid inflammatory response consisting of eosinophils, polymorphs with granulomatous reaction, and giant cell formation without caseation. Murthy GR, Rao AV. Sub-conjunctival cysticercosis. Indian J Ophthalmol. 1980 Jul. 28(2):77-8. [Medline]. Ziaei M, Elgohary M, Bremner FD. Orbital cysticercosis, case report and review. Orbit. 2011 Oct. 30(5):230-5. [Medline]. Rath S, Honavar SG, Naik M, Anand R, Agarwal B, Krishnaiah S, et al. Orbital cysticercosis: clinical manifestations, diagnosis, management, and outcome. Ophthalmology. 2010 Mar. 117(3):600-5, 605.e1. [Medline]. Sharma M, Beke N, Khurana S, Bhatti HS, Sehgal R, Malla N. An ocular cysticercosis case: Caused by Asian genotype of Taenia solium. Indian J Med Microbiol. 2015 Oct-Dec. 33 (4):583-5. [Medline]. Ding J, Zhao H, Lin J. Surgical Excision of Orbital Cysticercosis Lodged in Superior Oblique Muscle: Clinical Case Report. Medicine (Baltimore). 2015 Jul. 94 (30):e1026. [Medline]. Goyal S, Sandhu PS, Sharma A, Malik MA, Bansal P, Kaur J. Inferior rectus muscle ocular cysticercosis: A case report. Saudi J Ophthalmol. 2015 Apr-Jun. 29 (2):175-7. [Medline]. Raoot A. Lacrimal sac cysticercosis: a rare site for manifestation. Case Rep Ophthalmol Med. 2014. 2014:961815. [Medline]. Li JJ, Zhang LW, Li H, Hu ZL. Clinical and pathological characteristics of intraocular cysticercosis. Korean J Parasitol. 2013 Apr. 51(2):223-9. [Medline]. [Full Text]. Bartholomew RS. Subretinal Cysticercosis. Am J Ophthalmol. 1975. 79:670-73. Cantor LB, Rapuano CJ, Cioffi GA. Infectious ocular inflammation. Moorthy RS, Rao PK, Read RW, Gelder RNV, Vitale AT, Bodaghi B, Parrish CM. Basic and Clinical Science Course. 2014-2015. San Francisco: American Academy of Ophthalmology; 2014. 9: 370. Topilow HW, Yimoyines DJ, Freeman HM, et al. Bilateral multifocal intraocular cysticercosis. Ophthalmology. 1981 Nov. 88(11):1166-72. [Medline]. Kapoor S, Kapoor MS. Ocular cysticercosis. J Pediatr Ophthalmol Strabismus. 1978 May-Jun. 15(3):170-3. [Medline]. Sharma T, Sinha S, Shah N, et al. Intraocular cysticercosis: clinical characteristics and visual outcome after vitreoretinal surgery. Ophthalmology. 2003 May. 110(5):996-1004. [Medline]. Sandeep Saxena. Uveitis. Clinical Ophthalmology. 2nd. New Delhi, India: Jaypee Brothers Medical Publishers; 2011. 877. Messner KH, Kammerer WS. Intraocular cysticercosis. Arch Ophthalmol. 1979 Jun. 97(6):1103-5. [Medline]. Wood TR, Binder PS. Intravitreal and intracameral cysticercosis. Ann Ophthalmol. 1979 Jul. 11(7):1033-6. [Medline]. Seo MS, Woo JM, Park YG. Intravitreal cysticercosis. Korean J Ophthalmol. 1996 Jun. 10(1):55-9. [Medline]. Jain IS, Dhir SP, Chattopadhaya PR, Kumar P. Ocular cysticercosis in North India. Indian J Ophthalmol. 1979 Jul. 27(2):54-8. [Medline]. Chandra A, Singh MK, Singh VP, et al. A live cysticercosis in anterior chamber leading to glaucoma secondary to pupilary block. J Glaucoma. 2007 Mar. 16(2):271-3. [Medline]. Sachdeva RS, Manchanda SK, Abrol S, et al. Freely mobile cysticercus in the anterior chamber. Indian J Ophthalmol. 1995 Sep. 43(3):135-6. [Medline]. Adegbehingbe BO, Soetan EO, Adeoye AO. Case report: intraocular cysticercosis. West Afr J Med. 2003 Dec. 22(4):354-5. [Medline]. Chand K, Srivastava SK. Spontaneous expulsion of subconjunctival Cysticercus cellulosae. MJAFI. 2006. 62:188-9. Mohan K, Saroha V, Sharma A, et al. Extraocular muscle cysticercosis: clinical presentations and outcome of treatment. J Pediatr Ophthalmol Strabismus. 2005 Jan-Feb. 42(1):28-33. [Medline]. Bansal RK, Gupta A, Grewal SP, et al. Spontaneous extrusion of cysticercosis: report of three cases. Indian J Ophthalmol. 1992 Apr-Jun. 40(2):59-60. [Medline]. Sundaram PM, Jayakumar N, Noronha V. Extraocular muscle cysticercosis - a clinical challenge to the ophthalmologists. Orbit. 2004 Dec. 23(4):255-62. [Medline]. Labh RK, Sharma AK. Ptosis: a rare presentation of ocular cysticercosis. Nepal J Ophthalmol. 2013 Jan. 5(9):133-5. [Medline]. Sudan R, Muralidhar R, Sharma P. Optic nerve cysticercosis: case report and review of current management. Orbit. 2005 Jun. 24(2):159-62. [Medline]. Foster, Stephen; Vitale, Albert. Cysticercosis. Uveitis. 2nd. New Delhi, India: Jaypee-Brothers Medical Publishers; 2013. 1290. Honavar SG, Sekhar CG. Ultrasonological characteristics of extraocular cysticercosis. Orbit. 1998 Dec. 17(4):271-284. [Medline]. Atul K, Kumar TH, Mallika G, et al. Socio-demographic trends in ocular cysticercosis. Acta Ophthalmol Scand. 1995 Oct. 73(5):438-41. [Medline]. Tripathy SK, Sen RK, Akkina N, Hampannavar A, Tahasildar N, Limaye R. Role of ultrasonography and magnetic resonance imaging in the diagnosis of intramuscular cysticercosis. Skeletal Radiol. 2011 Nov 19. [Medline]. Sekhar GC, Honavar SG. Myocysticercosis: experience with imaging and therapy. Ophthalmology. 1999 Dec. 106(12):2336-40. [Medline]. Pushker N, Bajaj MS, Chandra M, et al. Ocular and orbital cysticercosis. Acta Ophthalmol Scand. 2001 Aug. 79(4):408-13. [Medline]. Kaur A, Agrawal A, Agrawal PK, et al. Lacrimal canalicular obstruction by cysticercus cellulosae. Orbit. 2006 Jun. 25(2):163-5. [Medline]. Sekhar GC, Lemke BN. Orbital cysticercosis. Ophthalmology. 1997 Oct. 104(10):1599-604. [Medline]. Beri S, Vajpayee RB, Dhingra N, et al. Managing anterior chamber cysticercosis by viscoexpression: a new surgical technique. Arch Ophthalmol. 1994 Oct. 112(10):1279-80. [Medline]. Das JC, Chaudhuri Z, Bansal RL, et al. Viscoexpression of anterior chamber cysticercus cellulosae. Indian J Ophthalmol. 2002 Jun. 50(2):133-5. [Medline]. Natarajan S, Malpani A, Kumar Nirmalan P, Dutta B. Management of intraocular cysticercosis. Graefes Arch Clin Exp Ophthalmol. 1999 Oct. 237(10):812-4. [Medline]. Santos R, Dalma A, Ortiz E, et al. Management of subretinal and vitreous cysticercosis: role of photocoagulation and surgery. Ophthalmology. 1979 Aug. 86(8):1501-7. [Medline].